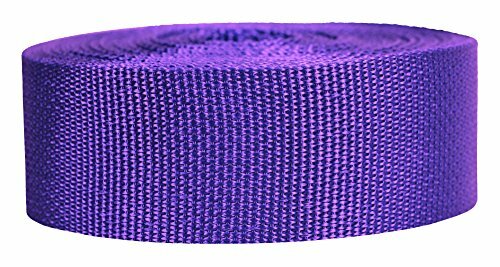 MORE THAN JUST A UTILITY WEBBING, Strapworks Polypropylene looks good too, available in a range of colors that will please any crafter, designer, or household tinkerer. CAN BE EASILY SEWN onto hardware such as buckles, slides, cams, or ratchets to create DIY straps. Build your own dog collar, create a belt with D-rings, replace a bag strap, or repair your lawn chair. VERSATILITY, DURABILITY, AND VALUE: easy to work with, strong enough for most tasks, water & UV resistant, won't stretch, and less expensive than nylon or polyester. A great choice for outdoor use! TENSILE STRENGTH (break strength) is 1200 lbs for the 2" webbing, with a thickness of approximately 0.04 inch. Webbing comes rolled and sealed in protective shrink-wrap. STRAPWORKS HEAVYWEIGHT POLYPROPYLENE WEBBING is also available, sold separately. For heavier-duty applications and higher break strength, you may want to consider this alternative. If you have any questions about this product by Strapworks, contact us by completing and submitting the form below. If you are looking for a specif part number, please include it with your message.